Statcounter provides customisable hit counters, visitor tracking, web analytics and website stats for iWeb (alternative). Note that StatCounter is not responsible for the content/quality of third party sites and we offer no warranties regarding same. We are very interested in feedback from our members regarding the different iWeb installation methods for StatCounter - so please feel free to let us know what you think! Ensure that you have downloaded and installed the iWeb SEO Tool by Rage Software - now copy your StatCounter code. 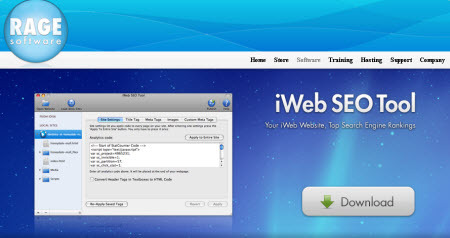 Open the iWeb SEO Tool. Open your iWeb site by clicking on the "Open Website" button and selecting the appropriate folder from your hard drive. Note that if you are opening your site directly from your iDisk (and not from your hard drive), then you must disable iDisk Sync - change it to "Off". The iWeb SEO tool will NOT function correctly if iDisk Sync is "On". When your site is loaded into the iWeb SEO Tool, you will see a list of all the files from your site on the left hand side of the interface. Under "Site Settings" (1), paste the StatCounter code into the "Analytics code" box (2) and press "Apply to Entire Site" button (3). Click the "Publish" button in the top right hand corner and enter the appropriate FTP or MobileMe details and that's it! Sign up for a Statcounter account using our iWeb (alternative) installation guide. You can reinstall iWeb (alternative) on your Statcounter project.